When a long-running series makes significant changes to the noteworthy tropes of the series, is it really a continuation or more of a spin-off or sidestory? The Annihilation Score is not the first book in the Laundry Files series, but it is the first to feature Dr. Dominique (Mo) O'Brien as the protagonist, and she doesn't spend much of the story interacting with the Laundry proper. How does she, and the rest of the novel, stack up? Not favorably. Following a disaster at the Laundry (a kind of government intelligence agency for supernatural horrors), Mo is dropped right into the middle of a new threat: CASE NIGHTMARE GREEN, a sudden increase in the number of people able to perform magic and leading to the ultimate destruction of Earth. However, these people don't realize that what they're doing is sorcery, and attribute it to superpowers, thus leading to an increase in superpowered vigilantism. After deftly stopping on such superpowered villain in a very public manner (very un-Laundry of Mo) with her possessed violin made of bone can devour demonic souls by being played (named by Mo "Lecter"), Mo is charged with assembling a superhero team and being a public face to draw attention away from the very secretive activities of the Laundry. However, Mo's admin team consists of a superpowered policeman, a vampire, and a mermaid. The vampire and mermaid have had previous relations with Bob, Mo's husband and protagonist of all prior Laundry books, and Mo's relationship with her husband is strained by the fact that he's inherited a great power that drives Lecter to try to compel Mo to kill him. And on top of all of this, the mysterious Dr. Freudstein appears to be a superpowered villain that Mo's agency has been formed to stop. 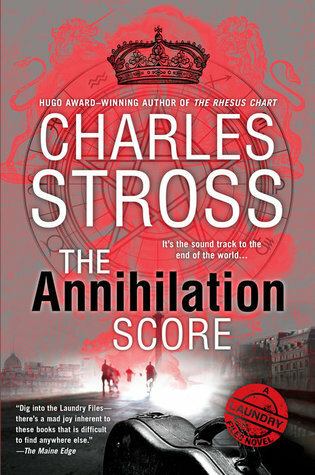 As with all Stross novels (at least those I've read), the story is deftly written, despite all of the moving parts. Just as impressive, there is not a lot of handwaving of the struggles that come with forming an agency that is designed to combat superpowered problems. However, in this case, the story could've used some more handwaving if it meant less words spent on meetings and bureaucratic drudgery and more time spent investigating the Freudstein menace and fighting bad guys. It almost seems like the story knows it spends too much time in meetings, as the question "why aren't you spending more time looking for Freudstein?" comes up in the novel. Yes, of course, the meetings and drudgery get stuff done, but it doesn't make for a good read. The cool stuff, the villains, the investigations, that stuff doesn't get near enough focus for all the time spent on meetings and relationships with characters that don't have a lot of meat to them. Overall, it's a story with some cool concepts (one of my favorite conundrums is whether or not superheroes are sorcerers!) that don't really pan out in the end, and leaves more than a few loose strings. Bonuses: +1 Some sharp references to current events re: internet abuse bleeding into real life. Penalties: -1 There are meetings. Lots of meetings. I hope you like Powerpoint.